Do any of you remember the big deodorant scare that happens a few years ago? Everyone was rushing to get aluminum free deodorants since scientists announced that it was possibly causing or contributing to Alzheimer's disease. While those studies have been disproven, many of us are still left wondering about the other synthetic chemicals found in commercial antiperspirants. Now scientists are saying that aluminum in commercial deodorants may be linked to breast cancer in women! With these scares, I have been a bit worried about my deodorant, which is the main reason I wanted to try Truly's Natural Deodorant when I found out about it. Over the past few years, I have tried dozen of natural deodorants. I have tried natural deodorants from leading brands, to small companies who created their own unique deodorants that smell great and supposedly work. There is only one thing I consistently learned from all of these – natural deodorants don't seem to work! Not only did they not work, but they left me broken out and feeling quite miserable. My desperation to find a natural deodorant got so bad that my husband finally put his foot down and told me to stop wasting money. When I heard of Truly's Natural Deodorant, I was really hopeful and my husband was preparing to have to have another deodorant collecting dust in the back of our cabinet. 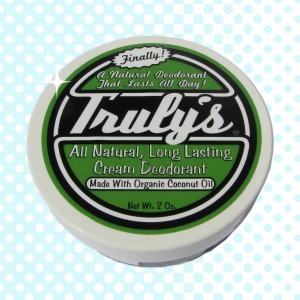 So the big question is – did Truly's Natural Deodorant work, or was it another all-natural dud? 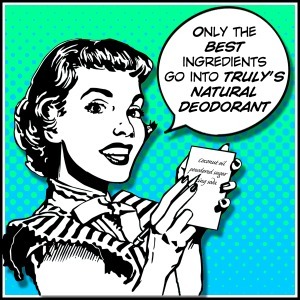 Unless you live in certain parts of the northeast, you likely have never heard of Truly's Natural Deodorant. This small company was first started in 2010 by the Collison family and to this day, is still run out of their home in Harrington, Delaware. While this deodorant may be new to us, many of the founder's friends and family had been begging Angela Collison to turn her deodorant recipe to a business, knowing it would be big. She decided in 2010 to take their advice and make Truly's Natural Deodorant – named after her youngest daughter, Truly Mae. Every year this deodorant is growing in popularity as more people discover one of the only natural deodorants that truly works! So, what makes Truly's Natural Deodorant different from all the others? For one, you can actually pronounce all the ingredients! Each bottle of Truly deodorant is made using only organic coconut oil, powdered sugar, baking soda, and beeswax. What allows this deodorant to work is a mixture of sugar and beeswax to prevent odor growing bacteria, the coconut oil to act as an antifungal and antibacterial agent, and of course, baking soda, which most of us who have made our own cleaners know is amazing at fighting odors. This unique formula lasts all day, has no harmful chemicals, and is non-staining, making it perfect for everyday use. I also love the fact that this deodorant was not tested on animals! Before I go any further, let me warn you about one thing – this stuff smells good enough to eat! The smell is similar to when you open a new jar of coconut oil or a bag of shredded coconut. If you love coconut, the smell of Truly's Natural Deodorant is absolutely heavenly! Along with the coconut, there is a slight hint of powdered sugar. I love putting this stuff on in the morning since it's such a fun fragrance! I just never thought of wearing something that smells like a freshly coconut cake! As for the deodorant itself, it is a bit different from what most people would expect. Instead of being in typical bar, it is cream container. Depending on the temperature of your home, this will be a hard cream or the consistency of a thick body lotion (coconut oil has a low melting point, so it changes its form easily. It only takes a few days to get adjust to this cream and a little pea size amount under each arm lasts you all day. 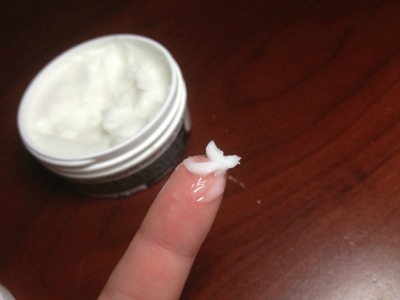 As an added bonus, any excess on your fingers just leaves your hands feeling soft and moisturized due to the coconut oil and beeswax! The big question is – how does it perform? Well, I tried this deodorant while exercising, being outside (admittedly in the winter), and working around the house. Not once did I smell and I found that Truly's Natural Deodorant seems to work just as well as my normal Degree deodorant. I didn't seem to sweat as much as I do with most natural deodorants and when I did, it didn't leave me feeling sticky and nasty. Really, it was nice exercising and only smelling slightly of coconut. It actually makes the whole sweating part with exercise a bit more comfortable and less embarrassing! The other thing I want to note is that I have sensitive skin. This is important since many deodorants actually make me break out. I found that Truly's Natural Deodorant is one of the few deodorants on the market that seems safe for sensitive skin. I have not broken out at all while testing Truly's, making me feel more confident about wearing short sleeved shirts and dresses. After using this deodorant for the past month, I have to say that I don't think I can go back to my normal Degree Deodorant. Not only does Truly's Natural Deodorant work, but I think it works just as well as the synthetic chemical-ridden deodorants available at most retail stores. This is the deodorant I have been waiting to find for years and I'm excited to share it with all of my wonderful readers. As you can guess from this review, I give Truly's Natural Deodorant an A+ rating – not only for having a wonderful products but even using packaging that is as eco-friendly as plastic gets! If you are looking for a new deodorant or an all natural deodorant for kids, I highly recommend giving this deodorant a try! If you would like to try Truly's Natural Deodorant, it can be found at the Truly's website, Amazon.com, or at a select number of natural stores. Online, you can purchase a 2 oz bottle of Truly's for $7.99. While this may sound expensive, keeping in mind that this bottle lasts anywhere from 4 – 6 months – making it only $1.33-$2 a month. To learn more about their deodorant and see the latest deals, make sure to check out Truly's Facebook Fan Page! 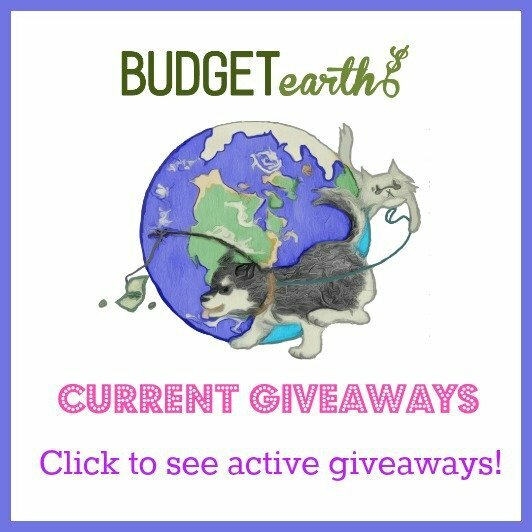 Disclosure: Budget Earth did not receive monetary compensation for this review and giveaway, but did receive a bottle of Truly's All Natural Deodorant for review purposes via < Tomoson.com. All of the opinions on this blog are the opinions of said author and these opinions may differ from your own. Powder sugar! Wow that’s new to me. Glad it worked for you. I love all natural deodorants. I thought I would never be that person but I am and LOVE IT. I don’t believe that there isn’t a link (sometimes scientists like to say they’ve disprove something so that we’ll continue to buy it – but I’m also a closet conspiracy theorist) but I also like the natural stuff because aluminum is also contributing to other health issues, thanks for letting me know about this product. This is really interesting. I’m definitely interested in it because I’ve had some skin reactions to other deodorants. Same here. I’m allergic to a lot of deodorant. Yes, you put a small pin-size amount on your finger. It sounds very odd to begin with but I like it since it actually is more like cream. It leaves your hands feeling very soft, even after watching 🙂 I make my own homemade soaps so I am a big fan of coconut oil! Does it easy wash out of your clothing? I’m all about using natural products for myself and my family! Very easily. Tested it by some on one of my old dark t-shirts and no stains or smell. I have wanted to transition to natural deodorants but didn’t like that they didn’t work as well. I’ve never heard of this one and would love to try it out! It sounds amazing and especially the scent! I’m big on scents! I’m always searching for more natural products so I will definitely check this out. I’m elated about it giving the needed coverage. WOOT! I love the idea of a “natural” deordorant. I have heard of Toms but this brand is new to me. I will have to check it out! thanks for the review. i actually seen it at T but i did not get approve yet. I need to check this out! I am always into green products and that. Thank you for the review. I was wondering how good this product was.. Thanks for sharing all the great information Susan. I grew up in the islands so coconut oil was a huge part of my childhood. I miss having easy access to it and I am too cheap to spend the money to get the good stuff. LOL. I will have to check this out. I love your reviews because they are always so in dept and honest. Works very well for me. The physical nature of it i highly temperature dependent. Also when hot is close to a liquid and could spill out if tipped over while open. I also found some jars not closed tightly when purchased and seeping out by a few drops. Experience over all quite pleasant an effective. It works better than my trader joes stick. I'm not crazy about having to apply by hand. I know it's not a big deal but I just don't want to have to wash my hands after applying. I have a new favorite that works really good. It's called Essensia Naturals, have you tried it? I'm an anti BO freak and the stuff I use now leaves me with zero BO all day. Love it. This would be the perfect deodorant to try for my daughter. She sweats unbelievably after receiving chemo a few years back. And she loves the smell of coconut. I'm off to check out their site. Thanks for Truly's review. I bought several natural brands off Amazon, this being one of them. I had never heard of it before then…I tried them all for a period of time to see which one worked. This is the ONLY one that did, and it works well. I bought 6 more jars so I don’t run out. I’m a guy that sweats a lot and hits the gym 3 times a week. This stuff keeps me smelling fresh all day through all of that. I’ve been telling all my friends about it too…it’s a great product.